For those of you have read more than a couple of my posts, you will know by now that I love the Mediterranean style of eating and drinking. In my eyes food should be social, and there’s nothing nicer than sharing dishes and taking your time over a meal. My passion for this style of eating comes from a short time spent au-pairing in the North of Spain during my summers at university. Most Sundays the family I worked for would sit down at home with cousins and grandparents to enjoy an afternoon of grazing. From about 2pm until 5 or 6 in the evening there was a gentle flow of sharing platters brought to the table – everything from fresh clams and enormous langoustines, duck pate and melba toast, to melt in your mouth Iberico ham and creamy manchengo cheese. This style of eating in the North of Spain in called “pica”. 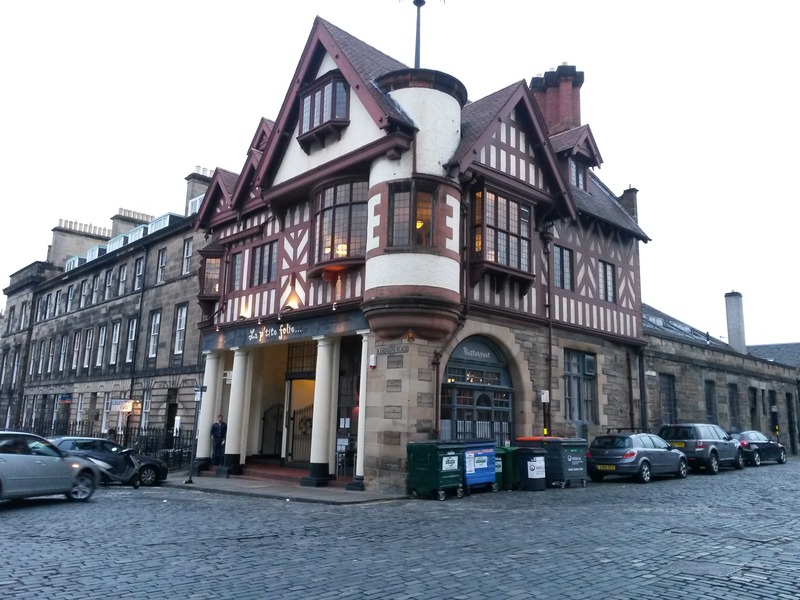 Le Di Vin, in the West End of Edinburgh, is somewhere that recreates this somewhat luxurious and lazy style of eating. The French wine bar on Randolph Place belongs to Virginie and Ghislain Brouard, the owners of La P’titeFolie which sits next door. The bar occupies an impressive building, once known as the Oratory of St. Anne. Inside, the bar runs along the side of the room, showcasing what must be hundreds of bottles of wine. 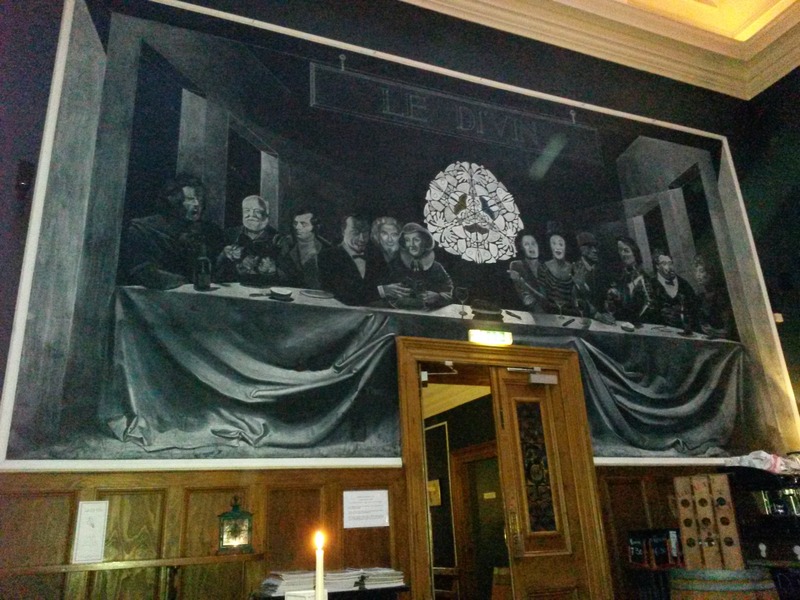 Above the entrance way is a quirky mural of famous Scottish and French faces, sitting in a “last supper” arrangement at either ends of the table. At 6.30pm on a Tuesday night I was pleasantly surprised to find the bar busy. The main wine list is extensive, and for those know very little about wine, like me, I’d advise asking the bar staff for a recommendation. If it’s just a glass you are after, there are also plenty options. We decided to share a bottle of Chablis, no. 25 from the wine list, which is described as a dry wine, light in colour with a touch of hazelnut. 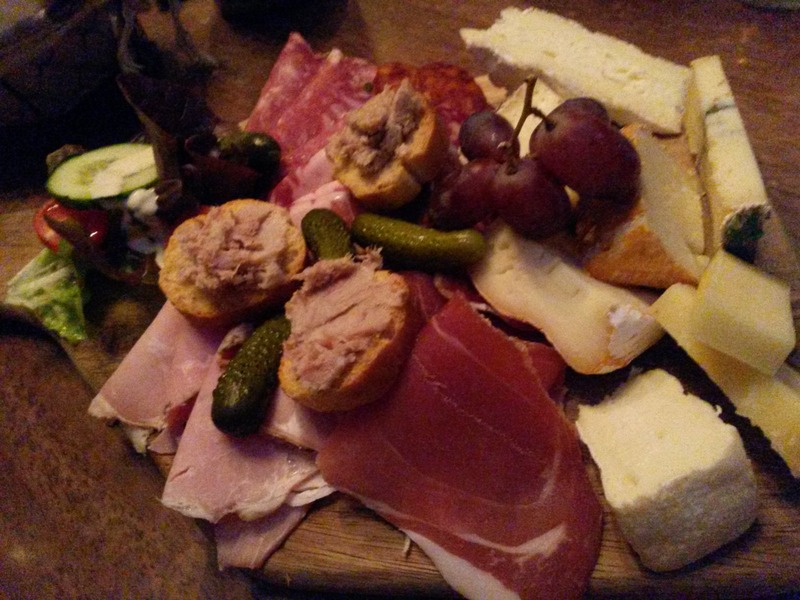 The food offering is simple – shared platters of meats, cheeses and fish. 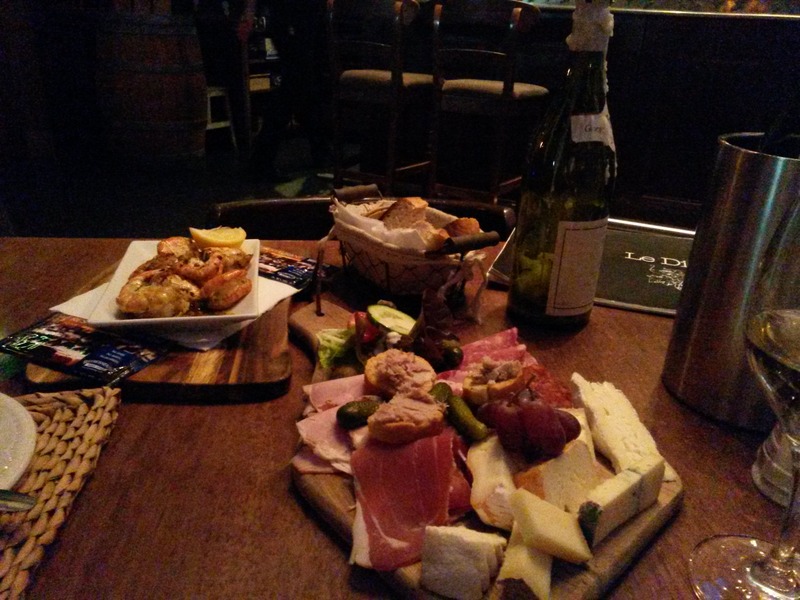 We chose a mixed platter of charcuterie and cheeses and a platter of the garlic prawns. And to top it off, some rillettes of Pork. All of the above was delicious, and we took a good two hours picking our way through the platter, guessing what was what and enjoying our wine. 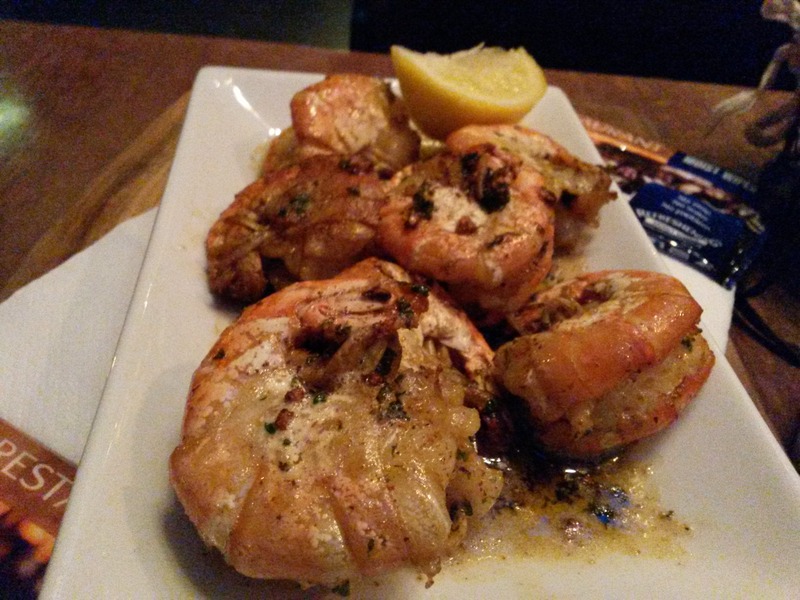 The garlic prawns should not go without a mention, for they were perfect. Huge, juicy prawns still in their shells, with plenty garlic, salt and herbs – what’s not to like! We left knowing it won’t be long until we are back. With summer in sight (well, almost, if you crane your neck quite far around the corner), Le Di Vin will be a great place to spend a lazy summer afternoon with a group of friends, or even just enjoy a single glass of wine, a nibble and gossip after work with girlfriends.